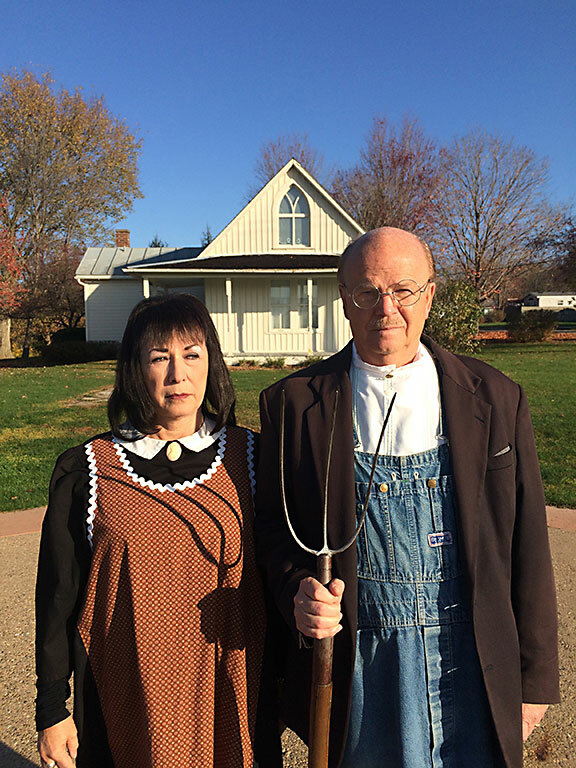 thousands who come each year to pose as the figures in Grant Wood’s iconic painting. A dour farmer, wearing overalls and a jacket and clutching a pitchfork, poses rigidly next to a pinch-faced, apron-clad woman who gazes sideways into the distance. Behind them is seen a modest white farmhouse whose second floor window has a pointed arch. Unlikely subjects for what is now one of the most recognized paintings in the world, but this tourist attraction is what Grant Wood’s American Gothic has become since he painted it in 1930 for a competition at the Art Institute of Chicago. The painting is now in the Institute’s permanent collection. The little farmhouse still stands in Eldon, Iowa, where Wood saw it (only once) during a brief stay. With its listing on the National Register of Historic Places in 1974 and its donation in 1991 to the State Historical Society of Iowa by its last private owner, the house is secure in its original location. Now, visitors come from all over the world travel to spend a little time in Eldon, to see the place that inspired Wood’s masterpiece, and to make themselves a little part of its story. 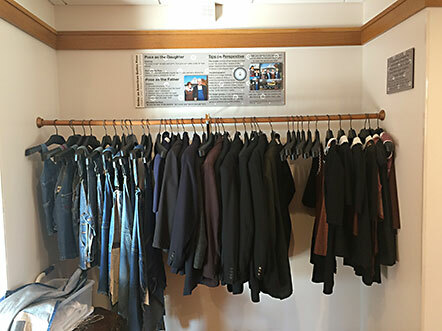 The American Gothic House Center maintains a rack of clothes for use by visitors who wish to get in character and put themselves "into the picture." 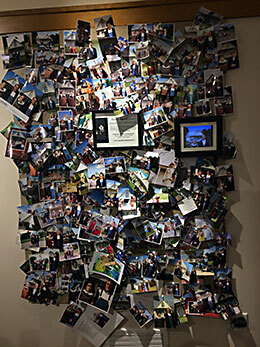 Photos on a wall inside the American Gothic House Center show some of the thousands of visitors who have posed in front of the farmhouse. 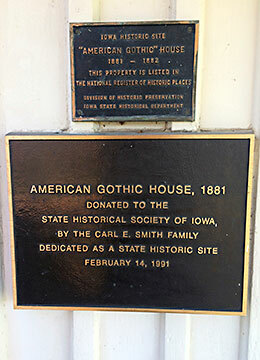 Plaque memorializing the listing of the "American Gothic" House on the National Register of Historic Places. AMERICAN GOTHIC HOUSE PARTICULARS. 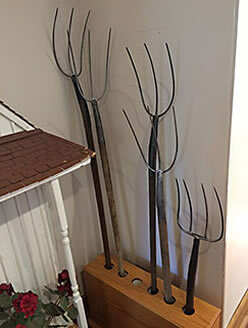 The American Gothic House is located at 300 American Gothic St. in Eldon, Iowa. Tours of the downstairs portion of the house are given the second Saturday of the month, April-October from 10 a.m. – 4 p.m. Due to the historic features of the house and grounds, accessibility for visitors with limited mobility can be challenging.The adjacent American Gothic House Center, “photo-op” area, and parking lot are all accessible. For more information, call 641-652-3352 or email TheAmericanGothicHouse@gmail.com. Admission to the Center is free. “American Gothic” by Thomas Hoving is an entertaining biography of the painting. 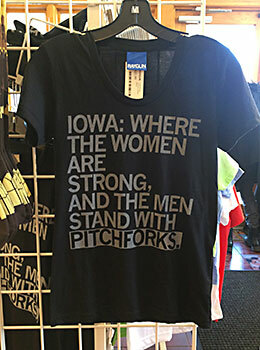 GRANT WOOD AROUND IOWA. Grant Wood (February 13, 1891 – February 12, 1942) is Iowa’s most famous artist. He was born on a farm near Anamosa but moved to Cedar Rapids when he was ten years old after the death of his father. From then on, Wood lived most of his life in Cedar Rapids or Iowa City, and died of cancer the day before his 51st birthday. 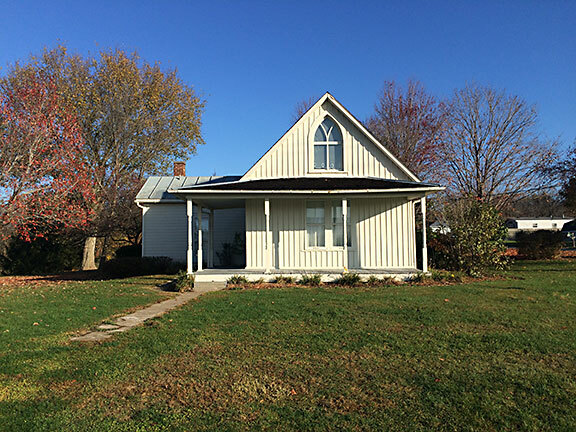 In addition to the American Gothic House in Eldon, Iowa, sites connected with his life and works include the Grant Wood Gallery and Visitor Center in Anamosa; the Grant Wood Studio and Home in Cedar Rapids; Grant Wood’s House in Iowa City; and Riverside Cemetery in Anamosa. “Grant Wood’s Iowa” by Wende Elliott and William Balthazar Rose is a useful guide for those planning a tour. inspired one of the most recognized paintings in the world.